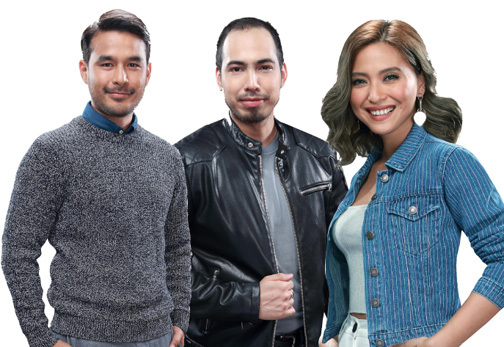 Broadcast journalist Atom Araullo, political analyst Richard Heydarian, and TV host Joyce Pring anchor ‘Stand for Truth,’ GMA’s grounbreaking online newscast. Anchored by multi-awarded broadcast journalist Atom Araullo, with political analyst Richard Heydarian, and TV host Joyce Pring, the weeknight online news airs Monday to Friday at 8:00 p.m. The 15-minute newscast is livestreamed via GMA Public Affairs’ YouTube account and GMA News Online and shared on GMA Network’s various social media sites. Stand for Truth incorporates music, the latest in mobile journalism, and new storytelling tools for online publishing. “This will revolutionize the way news is presented and at the same time will change the way the audience consume news and information,” Atom said during the program’s media launch. Leading the young team of reporters, the multi-awarded young documentarist, writer, photographer, and United Nations High Commissioner for Refugees (UNHCR) advocate anchors the digital program from the middle of the GMA Social Media Hub. GMA resident political analyst Richard Heydarian provides on-the-spot analysis of the biggest news of the day. He will also present a data-driven segment showing the numbers involved in an issue, the history, and the policies behind it. Born in Baguio, Richard took up Political Science at the University of the Philippines-Diliman and previously taught at De La Salle University and the Ateneo De Manila University. Richard is known for his expertise in the South China Sea dispute and Philippine current affairs. Meanwhile, Joyce Pring is in charge of the music segment of Stand for Truth using the language and #hugots of the generation. The Kapuso host will also interview some of today’s biggest bands and musicians in the country. Joyce is one of the hosts of the longest-running morning show Unang Hirit and GMANetwork.com’s Kapuso Artistambayan. She also produces the podcast #AdultingWithJoycePring and uploads vlogs on her YouTube channel every week. Aside from these experienced media personalities, a new breed of young reporters will take the spotlight in Stand for Truth. Young, aspiring journalists from Luzon, Visayas, and Mindanao sent in their sample mobile video reports using GMA’s YouScoop facility. They went through several levels of audition process until only 10 of them were chosen to undergo training and workshops by some of the country’s most-awarded and highly-esteemed broadcast journalists to continue the legacy of the GMA newsroom. These short-listed Stand for Truth reporters are: Bhea Jeem Docyogen, an Igorot and radio disc jockey from Baguio; Anthony Esguerra, a multimedia reporter, fellow in New Media and Journalism at Ball State University, Indiana, USA; Asmarie Labao, a former forester and DENR Information Officer from Marawi; Shai Lagarde, former TV producer and currently a lifestyle vlogger; Ardo Miravalles, Certified Public Account specializing in the media and entertainment industry; Darwin Quirino, Communications Officer for Department of Foreign Affairs-Office of Middle East and African Affairs; Manal Sugadol, a licensed English teacher and a former administrative assistant from Cotabato; Larize Lee, Chinese-Filipino and GMA Artist Center’s Public Relations Executive; Eduard Faraon, a Senior High School campus journalist; and Jerald Uy, former TV reporter, Road Safety Advocate, and vlogger. Catch Stand for Truth, Monday to Friday, 8:00 p.m. on www.gmanetwork.com/news and www://youtube.com/gmapublicaffairs.